Discussion in 'Downhill & Freeride' started by motomike, Sep 2, 2010.
does this guy ever sleep? it looks really good and im super excieted about this. i have yet to ride a Split pivot but im ever anxious to try one. Won't it just ride much the same as a single pivot or faux bar with the same suspension layout, accept for when you brake, then it'll stay much the same(as active), where the others will stiffen up(and squat or jack depending on pivot location)? Isn't Split pivot pretty much just a tidy floating brake? In regards to the Moorwood, how similer to the closest designed Specialized will it's supension feel? Because a bike has a split pivot will not make it have any special charactuer(as opposed to a similer designed solid swingarm bike)accept active suspension while braking will it? Not taking anything from the SP, it'll allow some some brilliant solid swingarm bikes to be built. Can a split pivot allow for any charcteuristic that could not be provided by a floating brake? trying a new tact asking questions instead of making statements to avoid getting harrassed by the internerds. Won't it just ride the same as a single pivot or faux bar with the same suspension layout, accept for when you brake, then it'll stay much the same(as active), where the others will stiffen up(and squat or jack depending on pivot location)? Isn't Split pivot pretty much just a tidy floating brake? Doesn't it allow the manuufacturer to create virtually what ever(solid swing arm)bike they desire around it? Because a bike has a split pivot will not make it have any special charactuer accept active suspension while braking will it? Don't take this as a negative, it'll allow for possibly some of the best bikes to date. I would love to ride a split pivot and then the same bike with the poivot just above the rear axle and see if I can feel the difference. My guess would bew that I can't. Still, I like the clean and tidy design of split pivot. Won't it just ride the same as a single pivot or faux bar with the same suspension layout, accept for when you brake, then it'll stay much the same(as active), where the others will stiffen up(and squat or jack depending on pivot location)? Isn't Split pivot pretty much just a tidy floating brake? In regards to the Moorwood, it'll ride similer to a similer Specialized won't it? Doesn't it allow the manuufacturer to create virtually what ever(solid swing arm)bike they desire around it? Statement away, you are 100% correct. After owning a bike with a floating brake arm and two fsr bikes, I'd prefer the suspension to squat than not. I'm way more interested in the Spooky Split Pivot bike. Geo on this looks uninspired. I'm still not sure if I prefer active or squating. I'm a hack, so I like active, but Ifind squat helps you feel and control the rear tyre better, or so it seems to me. Some stretched truths in that video. I'm guessing you'd notice it when braking. I'd like to compare it to a Hrost link. On another note, i wonder what will happen with brands that don't have the patent and use a rip ? Probably nothing i guess but still quite curious about it. Would behave exactly like a horst link in that it is designed to do the same thing. "Exactly" will get you into trouble horst link chain stays will lengthen a trivial amount, and all that could theoreticly go with that. But yeah, I think your right. Horst link Vs Split Pivot. I wonder if they charge the same amount for companies to use. HL offers lengthening chainstay, and being able to fine tune wheel path slightly, SP offers solid chainstay for the rad new Pinion gearbox used with Jackshaft or similer. HR could also work with trick Pinion gearbox, and tensioner. Both could work this way with it, and this'd probably be the lightest simplest method. Sorry I'm rambling/dreaming. I guess that this will be the new Shova. I remember an interview on the mountain bike show with the Craftworks bloke and he said something very small like $10-20 per frame, probably less. $20 dollars a frame adds up. Good to see DW having his stuff used and not just ripped off. Looks great. Didn't see this one coming. Ha, I found it last night searching around and went WTF. Super stoked on this bike. Split pivot aside, I like what they did with the geometry too. and kept the bb low even with the 150mm rear. Nice stuff dw and morewood! 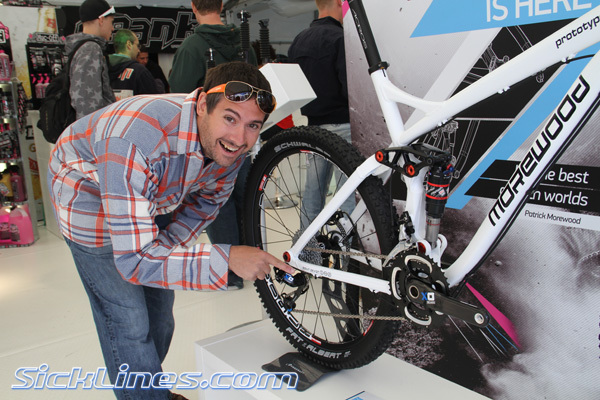 Wow, can say this is going to be sick and just maybe my next AM bike!!! This is exactly right. The level of anti-rise (braking "activeness") depends on the design of the rest of the linkage, but roughly speaking it is essentially just a tidy floating brake. Except for in most of the ones that have come out thus far, they are no more "active" than an average VPP or DW bike. These bikes usually have less anti-rise than a high single pivot, but still more than an average floating brake layout. For example Demo's have less anti-rise than most of the split pivot bikes I've seen thus far. Also have to remember that the amount of anti-rise is not just X% for all Horst bikes, Y% for all Split Pivots, and Z% for all SP's. Depending on the design and pivot placement on any given bike, you can get wildly different characteristics. There are FSR bikes which are as "active" as a high single pivot, and others which are nearly as active as a well-designed floating brake. Hence the importance of my comment above about not seeing any "fully active" Split Pivot bikes to date. Also important to remember when you see a new bike of any given layout, don't just assume it shares all the same favorable characteristics, in the same relative amounts as the bikes before it. yawn. slap a DW sticker on it and people will eat it up. He should just sell stickers. The only problem with this bike is that it's going to kill the Morewood Shova and that bike was my favorite Single Pivot, Morewood swingarms are a work of art. The same thing happens with the Devinci Wilson, the new one is nice but the old one was a beauty. I'll agree with ya there. I switch out my bikes every year or so, even the good ones, but the one bike I cannot bring myself to sell is my red shova. I ride that bike the most and it still looks new. Its still the best handling bike that I have ever ridden. Which leads me to the excitement about the new one. If they can make the current shova better and more fun to ride, I'd be amazed. We'll see. With the divine hand of DW it may be possible. When you do wanna sell it let me know. My Blur 4x is a wee bit too small for trail riding. Same here - I am not planning to sell my baby blue shova in the near future, looks great and rides great - full stop! love mine too but from the vibe i get from morewood they dont do things for the sake of it. There frame designs are always about what simply works best no frills, good stiff frames with dialed geo. I think if they didn't believe the split pivot was better then they wouldn't run with it. Im very excited about this. I had to stop myself from emailing in an order for one today. I hope they dont ditch the shova it would be cool for them to run it along side the split pivot bikes. Like santacruz with the heckler and the nomad/blur lt. I think u can only take a single pivot bike so far and to improve on it you have to add a linkage to help tune ur leverage curve etc. Morewood seem to have teamed up with the best guy in the business to go down this road and i reckon its a good move. That's a high pivot! With 2x10, and bigger granny rings i can see mfg's getting away with it but that's up with a 44t ring! -See http://www.vitalmtb.com/forums/The-Hub,2/Windham-Wrench-Report-Black-Mountain-Morewood-United,4539 for a photo and changes. Lots of changes in the hardtails.